I’ve been pretty much incommunicado for the last ten days. That’s not to say I didn’t have access to the internet, but the stately progress of the babee through England took priority over chewing the fat on recent events in Waterford GAA, even unto missing Tramore in the county Junior final where we, despite the presence of a large family delegation, took a bit of a hiding from Ballysaggart, losing by 1-18 to 1-9. As the lad said at the Minor homecoming, the seaside town is not renowned for producing hurlers, something that can not be said of Ballysaggart. The times, they are a-changing though. The Under-21’s defeated Portlaw in the Eastern Under-21 B final, and I was reliably informed when I went to see Tramore play Portlaw a few months back that there are more underage hurling teams at the club than football teams, so it might not be long before we will be able to take on the might of Ballysaggart and come out on top. Well done to Ballysaggart and hard luck Tramore. And well done to Tramore. It’s a fair observation. Can anyone say with certainty that De La Salle have ‘regressed’ since Michael Ryan’s days based on one loss after extra-time? It’s a ridiculously small sample size and ‘Treabhar’ makes the further point that DLS were stricken by a number of injuries. It would be reasonable to assume that if the county championship were started again in the morning, DLS would be favourites, so it’s surely not fair to say that they have gone backwards under Derek McGrath. Having said all that, any decision like selecting a new manager has to be based on variables, and when it comes to recent form the results produced by Peter Queally trumped those of Derek McGrath. Had the County Board decided to appoint Queally, everyone would have assumed that it was because he had taken ickle Passage to the promised land while Derek’s lot had gone from a whisker away from the All-Ireland final to crashing out at the quarter-final stages of the county title. You could argue this wouldn’t be fair, but you could justify it with a straight face. It all comes back to Harold Macmillan (and this time I’m going to spell his name right; cardinal sin for any political junkie): events have happened, and you have to react accordingly. Which is why I think Derek McGrath must have had a barnstorming interview. And you know what? That’s great! I hope he went in and wowed the interview panel with a stunning vision for the future of Waterford hurling. A panel of selectors with a judicious combination of learned wisdom and disruptive genius. Fitness coaches and physios capable of keeping the panel in tip-top condition and able to peak at just the right time. Sensible ideas for blending the undoubted talent at underage level – in case you hadn’t heard, we’re All-Ireland Minor hurling champions – into the Senior panel. Peter Queally was good. Derek McGrath was better. There’s a contrary narrative to this though that is all too common in sports administration in general and the GAA in particular – that the selection was made because his face happened to fit. Legend has it that an FAI official confessed to Eoin Hand that he had voted for him over Paddy Mulligan because said official believed that Mulligan had once thrown a bun at him. It’s pure GUBU, except for the Unbelievable and Unprecedented part. It wouldn’t be difficult to see the same kind of parish pump politics playing out in any County board, let alone the Waterford one. With all this in mind, I chose to believe that they made the decision based on the sound arguments I have outlined, and reading between the lines on the original Jackie Cahill story reassures me that this is the case. The bunfight alternative is too appalling to contemplate. This entry was posted in Hurling, Waterford and tagged De La Salle, Derek McGrath on 05/11/2013 by deiseach. When Tony Pulis decided to give his best always-bring-the-cornflakes-when-going-abroad performance after Luis Suarez’s dive in Liverpool’s recent match with Stoke City, he could not have anticipated that his words would have an impact on events in the middle of the League of Ireland. A few weeks later, Seán Maguire would get booked for a dive in Waterford United’s match against Dundalk in the RSC, one of a spate of yellow cards dished out in the aftermath of the stink surrounding Suarez’s dive. I say this on an anecdotal basis without any stats to back it up, but it felt that way as referees reacted to a universal feeling that diving was a problem that they had been indulging it. Seáni had reason to feel aggrieved because he hadn’t dived and would probably have gotten a penalty but for a sudden bout of puritanism on the part of the officials that didn’t exist a few weeks before. What should be acknowledged is the referee today got it right when he sent John Keane off. The rules are crystal clear – “To strike or to attempt to strike an opponent with a hurley, with minimal force” is a red card offence. It comes under the same category of infractions as spitting and abusive language to an official. And I don’t buy the defence that the game will be brought to ruination by supposedly over-officious refereeing. There’s no place in the game for striking with your hurley. However, De La Salle will have the entire winter to bitterly reflect that officials have being ignoring stuff that borders on brutality in recent years, and it’s only now after Maher’s moronic performance went unpunished that referees have suddenly remembered that part of the rule book. I have no doubt that the referee today did not want to be seen to ‘do a Shaughnessy’. It would be nice if this policy of applying the rule book stuck. It’ll be too late for John Keane and De La Salle though. Update 28/11/2012: great minds think alike/fools seldom differ (delete as applicable). 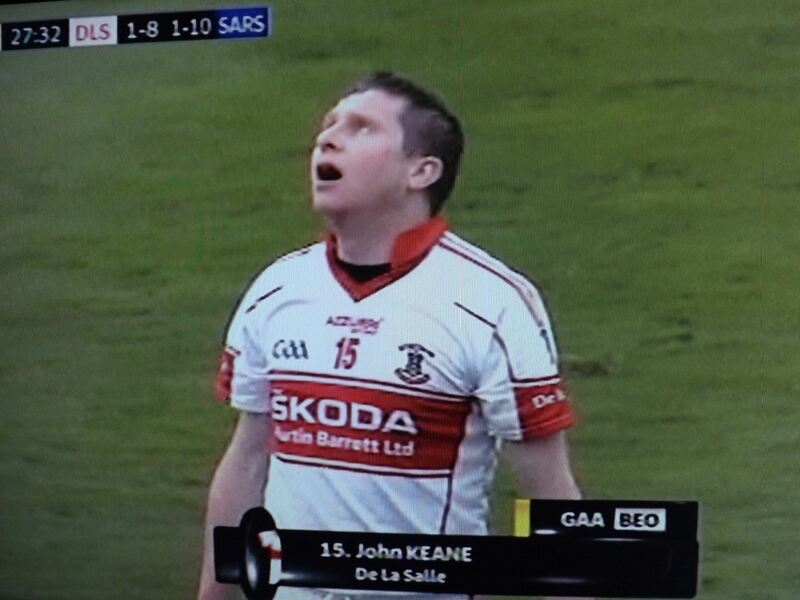 Donal O’Grady was thinking along the same lines as I was watching John Keane’s dismissal. Meanwhile, Brian McDonnell has a thorough (scarily so) summary of the various attitudes to the road hurling has headed down on his blog. 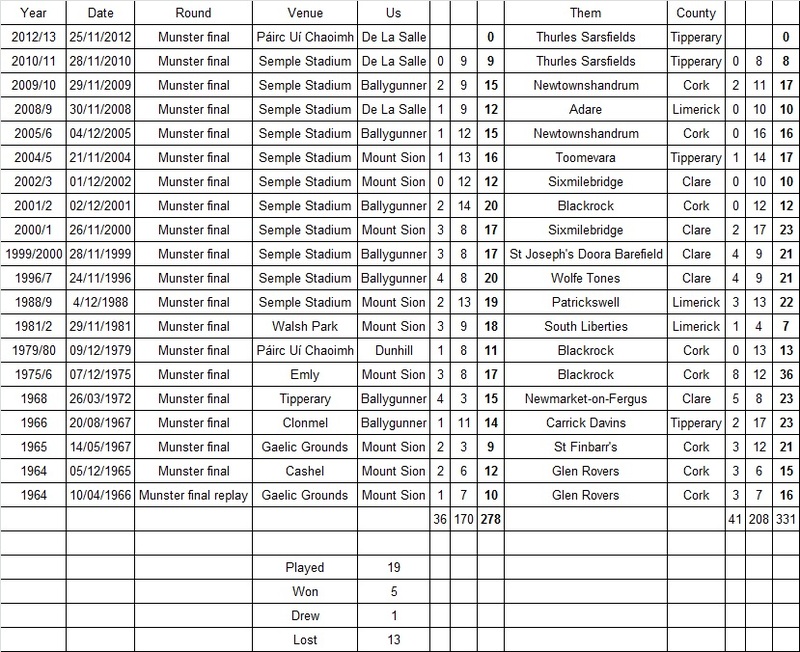 This entry was posted in Hurling, Munster, Waterford and tagged De La Salle, Munster on 25/11/2012 by deiseach. From the perspective of the 21st century, places like Emly and Cashel must seem like strange places to hold a final. But if you think about it – why not? Why allow these games to be swallowed up by cavernous venues designed for Biblical crowds in high summer? There is some rationale to playing these kind of matches in Croke Park, where the club player can experience the thrill of playing in Headquarters, but this hardly applies to Páirc Uí Chaoimh. No, scratch that. It definitely doesn’t apply to Páirc Uí Chaoimh. The only reason I can think of is that the Munster Council have gotten too posh to be staging its grand occasions in piddling little venues like Clonmel. It’s possible that Clonmel isn’t up to scratch in terms of handling the demands of a crowd of a few thousand – the demographic of 1966 wouldn’t have worried too much about queuing for toilets. But if the facilities at places like Clonmel are such that you can’t play a Munster club final there anymore, that is a further indictment of the folly of sinking so much of the province’s resources into Thurles, Cork and Limerick, three giants hoovering up everything in their atmosphere like Jupiter or Saturn. Unfortunately the result of all this is that we can look forward to atmosphere on Sunday week that will be comparable to Mars or Pluto. This entry was posted in Hurling, Munster, Waterford and tagged De La Salle, Munster, Pairc Ui Chaoimh on 13/11/2012 by deiseach. For the second game in a row, Cóláistí na nDéise (CnD) had to overcome the handicap of having a player sent off before the game started to carve out a marvellous victory over De La Salle (DLS) in the Harty Cup semi-final in Fraher Field today. There was disarray before the beginning of the game when, first of all, referee Cathal McAllister took ages to get a sliotar to start the game and then had his attention drawn by the umpires at the town goal. Following consultation, McAllister showed the CnD full forward Kevin Daly a straight red card, followed by a yellow for DLS full back Paul Coughlan, which was to prove significant. The rain which had been falling since early morning continued throughout the game, and in the circumstances the skill showed by both sides was commendable. There was also a stiff breeze blowing towards the town goal and CnD were definitely fortunate to have its assistance in the first half, as it would have been a big ask if they had to chase a substantial lead in the second half in these conditions. As in their previous game, CnD (made up of the Augustinian and Christian Brothers schools in Dungarvan) made light of their numerical disadvantage by getting stuck in from the off, working their socks off, and displaying a super first touch throughout the field. Their defenders were adept at stopping their opponents from getting possession and were impressively physical against what was a bigger DLS team. CND got the tonic of an early goal when Cathal Curran’s free was knocked down in the goalmouth for corner forward Michael Kiely to finish to the net. Once they got their eye in, the CND forwards – especially Cathal Curran – began to build up their points tally and they got a real boost halfway through the half when centre forward Michael Harney struck a marvellous goal from all of thirty yards. At the other end DLS found it impossible to get on the scoreboard despite having plenty of chances. Their shooting for points into the wind went all awry and they also spurned a couple of clear goal chances. They finally got a shot on goal just before the interval but CnD goalie Eoin Kearns made a great save. Overall DLS hit eight first half wides to CnD’s four. CnD’s cause got a further boost just before half time when the DLS full back Paul Coughlan got a second yellow card for a hurley throw which at least had the intended effect of putting off a CnD forward who had got through for a shot on goal. Cathal Curran knocked over the resultant free to send CnD in at half time leading 2-9 to no score. DLS needed a good start to the second half but it was CnD who stretched their lead with another excellent Curran effort. DLS then gradually took over as CnD tired and began to control midfield. The points finally started to flow but the excellent CnD defence yielded few openings for the goal DLS desperately needed. DLS lacked leadership with no one prepared to run at the CnD defence whereas, playing against the wind, CnD repeatedly carried the ball out of defence and generally used it well, playing to the wings for the speedy Curran brothers to run on to. DLS did get a bit of a lifeline when Austin Gleeson’s shot from a forty-yard free found the net off Eoin Kearns’s hurley with 15 minutes to go. However, they were unable to follow up and were it not for some over-elaboration on the part of the CnD forwards and a couple of missed frees from Cathal Curran, CnD would have won even more convincingly than the final scoreline of Coláistí na Déise 2-14 De La Salle 1-8 (CnD’s last point wasn’t registered on the score board). Leading the way for a CnD team which played well throughout the field was Cathal Curran, five of whose seven points came from play. The unrelated Cormac Curran, a late call-up in midfield, also had a mighty game, including three points from play. Right half back Tadhg Burke and centre back Tom Devine were also to the fore. Austin Gleeson was DLS’s main man. Their starting fifteen only scored one point from play. They got four second half points via substitutes, with Adam Farrell (I think) getting two or three of them. A feature of the CnD team was the fact that only one of the players was from Abbeyside with four from Dungarvan (all of them forwards). The rest were from intermediate and junior rural clubs, and their skill levels are a great tribute to the work being done at juvenile level in the west of the county. On the basis of this display, and with Kieran Power expected to be back for the final, they must have a good chance of going all the way. Coláistí na nDéise: Eoin Kearns (St Mary’s), Evan Collins (Abbeyside), Tom Tobin (St Mary’s), Seán O’Donovan (Modeligo), Tadhg Bourke (Clashmore), Tom Devine (St. Patrick’s), Kealan Looby (St Oliver’s), Colin Dunford (Colligan) (0-1), Cormac Curran (Brickey Rangers) (0-3), Cathal Curran (Dungarvan) (0-7, 0-2 frees), Michael Harney (Bonmahon) (1-0); Ryan Donnelly (Dungarvan), Patrick Curran (Dungarvan) (0-2), Kevin Daly (Dungarvan), Michael Kiely (St Mary’s) (1-1). Sub: John Gartland (Ardmore) for Michael Kiely (inj). De La Salle: Mark Sheridan (Erin’s Own), Billy O’Keeffe (Ballygunner), Paul Coughlan (Ballygunner), Kevin Walsh (Piltown), Adam O’Sullivan (De La Salle), Austin Gleeson (Mount Sion) (1-3, all frees), Sam O’Neill (Erin’s Own), Chris Breheny (Butlerstown), Shane McNulty (De La Salle), Mark O’Brien (Ferrybank), Barry O’Sullivan (Ballygunner) (0-1), Tom Mullally (Ballygunner), Dessie Hutchinson (Ballygunner), Pat Flynn (De La Salle), Darragh Flynn (Erin’s Own). De La Salle brought on a number of substitutes (who scored four points between them) but apparently their numbers were not correct. This entry was posted in Hurling, Match Reports, Waterford and tagged Cóláistí na nDéise, De La Salle, Harty Cup on 06/02/2012 by deiseach. De La Salle took the first step on what they hope will be a journey to Croke Park next March – let’s be honest, it’s got to be on their minds – with a routine win over luckless Passage in Walsh Park. The challengers faced into a stiff wind in the first half, one so strong that at one stage a puckout from Passage goalie Eddie Lynch dropped on his own 45. 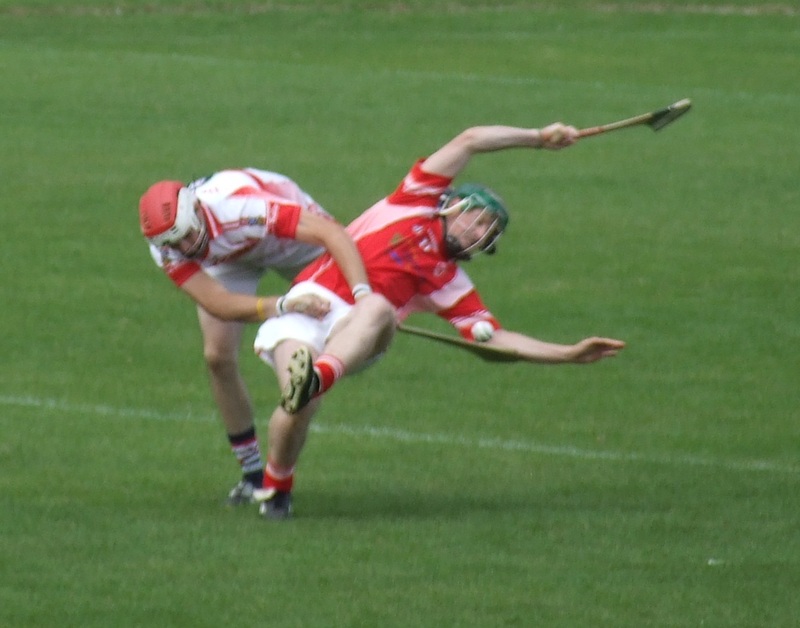 Passage seemed to cope well with this imposition though, two points from frees from Eoin Kelly opening the scoring. Perversely De La Salle were making a hash of the wind, numerous balls into the corner trickling out wide. When Paudi Nevin did manage to get around the back he got too close to the endline and his shot across the goal was saved with the follow-up from John Mullane going wide. He finally got De La Salle off the mark with a free and a Jake Dillon point after the aforementioned tornado held up the puckout levelled matter in the 1oth minute. You’d have thought it would be only so long before De La Salle got the measure of the wind so Passage were going to have to make the most of their chances, and Eoin Kelly did with their first goal, gathering the ball and shooting with what seemed just be the intention of hitting the target (© Alan Hansen), a poorly-struck bobbler than John Coady in the De La Salle goal made a complete hash of to give Passage three precious points. It was as good as it got for Passage in the half though. Some loitering on a sideline ball by a Passage back caused the ref to throw the ball in and Jake Dillon punished such silliness with a point and a couple of frees from Mullane soon levelled matters. De La Salle were beginning to find their range, dropping the ball into the half-forward line and letting them run on to it rather than putting it over the heads of the full-forward line. Successive points from Nevin and John Keane followed this template, then Nevin galloped onto an air-shot from a Passage back to create an opening only to be dragged down. Passage took their collective eye off the ball which allowed Mullane to take a short free to Dillon who smashed the ball to the net and suddenly the lead was out to five. It was a moment that would come to mind a few minutes later when, having swapped points to leave the score at 1-8 to 1-3, Eoin Kelly drew a foul in a point-scoring area. Kelly, who had spent the half closer to the midfield than the full-forward line, tried to emulate De La Salle with a tapped-free to Owen Connors but they were more prepared for it and the shot was deflected out for a 65 which was gallingly hit wide. Kelly got a free not long afterwards to ease the pain but the need to score a goal was misplaced – any score would be useful in those conditions. De La Salle, on the other hand, must have been aware that four points wouldn’t be much of a cushion so were eager for another goal. Eoin Madigan nearly got in for one but was too close to the endline and couldn’t find his way between the goalie and the near post, although Bryan Phelan notched the subsequent 65. Then a sideline ball from near the halfway line went all the way through to Mullane who teed up an onrushing Dillon to hammer the ball home. And what a hammer blow it was. The lead had doubled from four to eight in injury time in the first half. I wrote recently about the panic that comes when you find yourself a couple of goals down at half-time and Passage must have had that sinking feeling when an early free stretched the lead to three goals. A fine score over-his-shoulder by Stephen Mason was matched by one from Killian Fitzgerald on the run to keep the gap at nine. As the rain began to spit down Kevin Moran was exactly the man to have in such difficult conditions and John Mullane was now loitering in the midfield as Kelly had done in the first half for Passage to win some clean possession for De La Salle. A couple of quick Passage points hinted at a comeback but they put themselves right on the back foot again when a poor sideline cut – Passage were particularly shocking in this department all day – from Jason Roche was rammed back into the danger area with interest. Passage managed to scramble the ball out for a 65 and Phelan did the needful. When Passage did get a sideline cut right Eoin Kelly proceeded to smack a nothing ball into the forward line. He did strike a massive free from wat out but ultimately would cut a frustrated and occasionally frustrating figure for the entire second half. Passage couldn’t unsettle De La Salle, mostly thanks to the doughty Moran. A point from Thomas Connors was matched by a free from Mullane and there were a couple of instances of Passage players throwing the ball away as they sensed the match ebbing away from them. They finally got a break when Thomas Connors slipped his marker in the middle and raced towards goal. The professional foul was committed but Eoin Kelly has previous in these situations and you knew he had only thing in mind. He thumped the ball high to the net and the gap was down to five with seven minutes to go. A cheap free awarded to Mullane settled any nerves De La Salle might have had, and when Patrick Walsh felt the need to go for a goal when most of the De La Salle team was between him and the net you knew Passage were clutching at straws. There was time for Kelly to overhit another ball wide and for Dillon to score after a swashbuckling sashay through the Passage defence to put the tin hat on it. A goal scored after a long distance free dropped in by Joe Upton (I think – the person behind me said “well done, Joe” so I’ll run with that) went all the way to the net was purely academic as it obvious to everyone that this was the last puck of the game. I’d like to shy away from statements about how Ballyhale/Clarinbridge/Tippecanoe and Tyler too won’t be losing any sleep over that result, but it’s unavoidable. Twelve wides testified to De La Salle’s struggles to get to grips with the conditions and Passage were powder-puff in attack. Still, they won it pulling up and with Lismore out of the race things are looking a little easier for them in Waterford. This entry was posted in Hurling, Match Reports, Waterford and tagged County Championship, De La Salle, Passage on 18/09/2011 by deiseach. 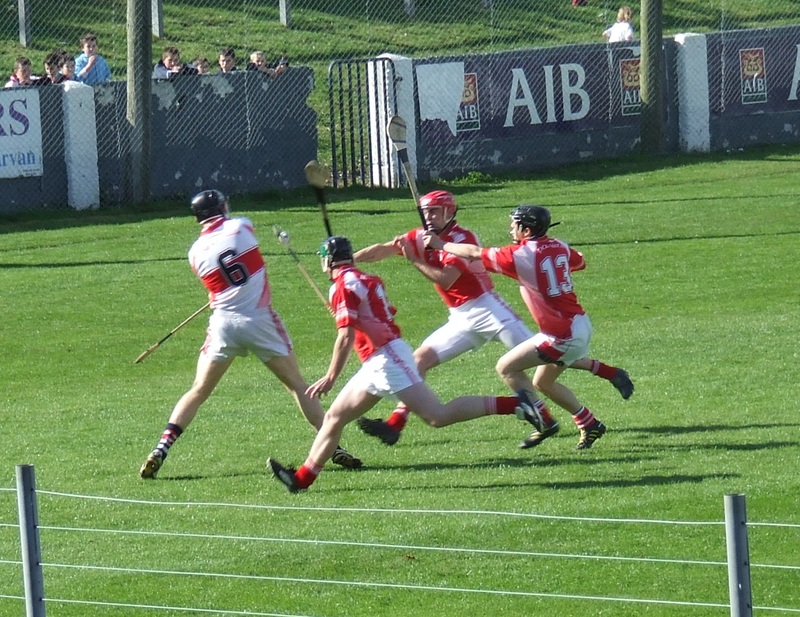 This entry was posted in Hurling, Waterford, Waterford gallery and tagged County Championship, De La Salle, Passage on 18/09/2011 by deiseach. It was often said that losing at the semi-final stage of the English FA Cup was worse than losing in the final. There was a a sliver of validity to this notion in an era when playing at Wembley was a special experience but generally it was a comment made by pundits who couldn’t think of anything original to say. And the failure of yet another Waterford team at the semi-final stage doesn’t make it any more true. Given the beatings we’ve taken in finals, there might be a perverse relief to be had from De La Salle’s loss to Clarinbridge. Maybe O’Loughlin Gaels would have done unto DLS as Portumna did unto DLS in 2009. Still, even putting aside the heart-breaking manner of the defeat, it’s disspiriting that we can’t seem to get over the semi-final hump. A Kilkenny contributor on AFR once ridiculed our efforts over the years on the basis that if you couldn’t even win semi-finals on a frequent basis you couldn’t claim to have come ‘close’ to winning the All-Ireland. This guy was a particularly vicious individual, the type of character who thinks that the excellence of his fellow countymen at hurling makes him a better person than anyone from Waterford, and would usually sprinkle his comments with asides on the moral fibre (or, as he saw it, the lack thereof) of the Suirside townies so it would be wise not to take his analysis too much to heart. But on this subject, he had a point. Nicholas Soames once observed that the Tories would not get anywhere while they persisted with their “mad obsession with gays, blacks and women“. It’s not the same thing of course, but the sentiment could be fruitfully rejigged for Waterford – we ain’t going anywhere fast if winning semi-finals remain a psychological barrier. It was a happier weekend for the county teams, although if someone had said before Sunday that one team would win well while the other would squeak home, you would have put it down as happening to the hurlers and footballers respectively, not the other way around. One could charitably say that Wexford had their Oulart-the-Ballagh contingent back, but reading Giveitfong’s match report doesn’t inspire confidence. So let’s hear it for the footballers who stuck it to the team who beat them in the Division Four final and the Munster championship last year. The best result of the weekend coming from the big ball game. Who would’ve thunk? This entry was posted in Football, Hurling, National League, Waterford and tagged Clarinbridge, De La Salle, Limerick, Wexford on 22/02/2011 by deiseach.